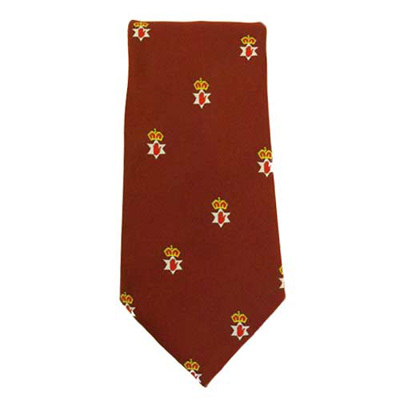 Northern Ireland/Ulster insignia - Wine - Ulster Neck Tie  - £15.95 : Traditional Irish Gifts - Irish Gift Shop - Guinness merchandise, Bushmills merchandise, Aran and Avoca., The best Irish giftware shop on planet earth! 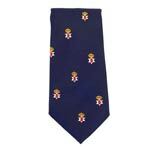 The Red Hand of Ulster topped with a Crown is depicted on this formal neck tie. The origins of the Red Hand symbol are shrouded in myth. One explanation claims that at a time when Ulster had no rightful heir a boat race was organised between the rival claimants. The winner and therefore new ruler of Ulster would be whoever's hand first touched the shore. In his desire to be the winner one of the rivals cut off his own hand and threw it ashore!